Enter your email address (i.e. “frankb@lmi.net”), password, and Display Name. Click the check box that says “Manually Configure server settings for this account” then click Next. Click the check box for “This server requires a secure connection”. Notice that the Port # changes to 995. Set “Log on Using” to “Clear text authentication” if it is not already selected. 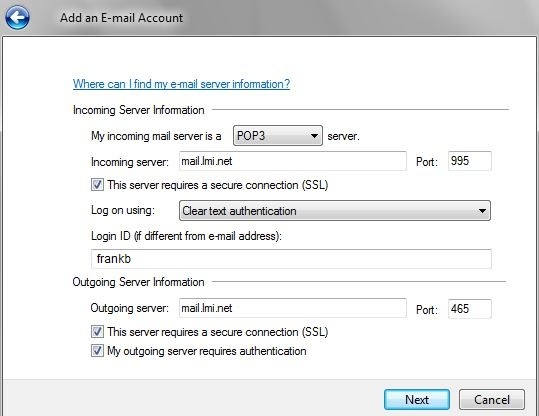 The Login ID is your mail server account name. (For example, if your email address is “frankb@lmi.net” then your Login ID is “frankb”). Click Next, and then OK at the next dialog, and you are finished. If you want to edit mail account settings, right-click on the account name that appears on the left side, then choose “Properties”. You may want to do this right away if you want to change the Mail Account name that shows up on the left side of the interface. 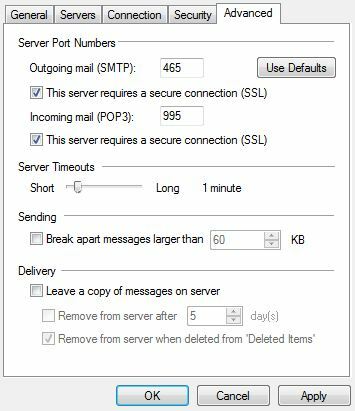 Note: Windows Live Mail does not by default display the usual menu bar at the top that users of Outlook or Outlook Express would be familiar with. To enable the menu bar, type “Alt-M” to open the Menu Bar tool, then “m” to select “Show menu bar” (of just click the option). You will need to display the menu bar to access the Tools menu and other advances features.